Dragons have long been absent from their ancestral home in the Veiled Valley. Through spells and deceptions, a mysterious shape-shifter has attacked them and threatens the Valley's hard-won tranquility. With the dragons' strengths and magic apparently gone forever, the lives of the Valley's humans and otherworldly creatures hang in the balance. But the days of the dragons may not have ended. Two young dragonriders with secrets of their own rediscover surviving dragons and help them fulfill an ancient prophecy. Will their generation heal the rift between human and dragon? Will their elders, long enemies of the dragons, recognize and defend against the new menace before it destroys them? 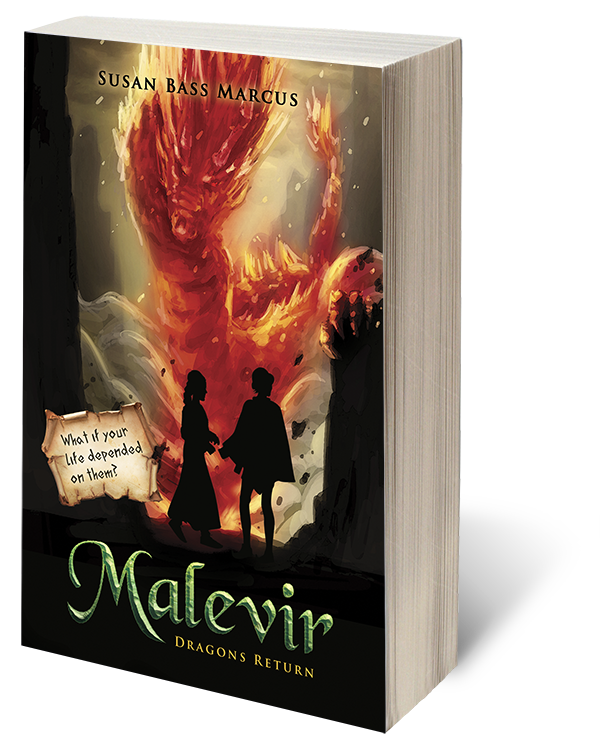 Malevir: Dragons Return is the first of Susan Bass Marcus' fantasy adventure trilogy, a fresh take on classic themes of family, courage, and sacrifice that recalls the thrills fans find in the work of Anne McCaffrey or J.R.R. Tolkien. In the past, Marcus worked as a story teller and puppeteer, skills she brought to her long career in museum education. Her original story-filled curricula and public programs enlivened her museum programs for more than 100,000 patrons over three decades. Her writings include ongoing work on the Malevir trilogy, short stories, and online media.